Klickitat County is a county located in the U.S. state of Washington. As of the 2010 census, the population was 20,318. 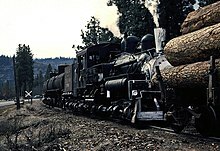 The county seat and largest city is Goldendale. The county is named after the Klickitat tribe of the Yakama Native Americans. 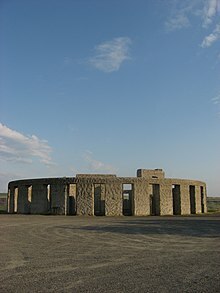 A replica of Stonehenge built by Samuel Hill as a monument to local men killed in World War I called Maryhill Stonehenge. Klickitat County was created out of Walla Walla County on December 20, 1859. Samuel Hill was an early promoter of the area, promoting better roads and building local landmarks such as a war memorial replica of Stonehenge (Maryhill Stonehenge) and a mansion that would become the Maryhill Museum of Art. The Sam Hill Memorial Bridge across the Columbia River is named after him. According to the U.S. Census Bureau, the county has a total area of 1,904 square miles (4,930 km2), of which 1,871 square miles (4,850 km2) is land and 33 square miles (85 km2) (1.7%) is water. As of the census of 2000, there were 19,161 people, 7,473 households, and 5,305 families residing in the county. The population density was 10 people per square mile (4/km²). There were 8,633 housing units at an average density of 5 per square mile (2/km²). The racial makeup of the county was 87.56% White, 0.27% Black or African American, 3.47% Native American, 0.73% Asian, 0.21% Pacific Islander, 5.02% from other races, and 2.75% from two or more races. 7.81% of the population were Hispanics or Latinos of any race. 17.7% were of German, 14.0% United States or American, 11.1% English and 9.6% Irish ancestry. 90.3% spoke English and 7.8% Spanish as their first language. There were 7,473 households out of which 32.30% had children under the age of 18 living with them, 57.70% were married couples living together, 9.10% had a female householder with no husband present, and 29.00% were non-families. 23.80% of all households were made up of individuals and 9.00% had someone living alone who was 65 years of age or older. The average household size was 2.54 and the average family size was 2.99. The age distribution was 27.10% under the age of 18, 6.50% from 18 to 24, 25.70% from 25 to 44, 27.00% from 45 to 64, and 13.80% who were 65 years of age or older. The median age was 40 years. For every 100 females there were 99.50 males. For every 100 females age 18 and over, there were 98.80 males. The median income for a household in the county was $34,267, and the median income for a family was $40,414. Males had a median income of $36,067 versus $21,922 for females. The per capita income for the county was $16,502. About 12.60% of families and 17.00% of the population were below the poverty line, including 22.50% of those under age 18 and 15.10% of those age 65 or over. Of the 8,327 households, 27.6% had children under the age of 18 living with them, 54.5% were married couples living together, 8.5% had a female householder with no husband present, 32.4% were non-families, and 26.4% of all households were made up of individuals. The average household size was 2.42 and the average family size was 2.88. The median age was 45.3 years. The median income for a household in the county was $37,398 and the median income for a family was $46,012. Males had a median income of $43,588 versus $31,114 for females. The per capita income for the county was $21,553. About 13.7% of families and 19.5% of the population were below the poverty line, including 33.9% of those under age 18 and 9.4% of those age 65 or over. Klickitat is located in Washington's 3rd congressional district, which has a Cook Partisan Voting Index of R+2 and has been represented by Republican Jaime Herrera Beutler since 2011. In state government the county is part of the fourteenth district so is represented by representative Gina McCabe (R) and Norm Johnson (R) in the Washington House of Representatives and Curtis King (R) in the Washington State Senate. In Presidential elections Klickitat is something of a "swing county." In 1988 Michael Dukakis narrowly won the county with 49.15% of the vote. Richard Nixon (1960, 1972), Ronald Reagan, Bill Clinton, and George W. Bush all won the county twice. In 2008 Democrat Barack Obama won Klickitat County over Republican John McCain by only 21 votes or percentage wise 48.85% to 48.64%. In 2012 Republican candidate Mitt Romney won the county by a greater margin than in the previous election, with 51.74% of the vote compared to President Obamas 44.75%, and Donald Trump doubled Romney’s margin in 2016. ^ The leading "other" candidate, Progressive Theodore Roosevelt, received 795 votes, while Socialist candidate Eugene Debs received 351 votes, Prohibition candidate Eugene Chafin received 107 votes, and Socialist Labor candidate Arthur Reimer received 15 votes. Wikimedia Commons has media related to Klickitat County. ^ a b c "DP-1 Profile of General Population and Housing Characteristics: 2010 Demographic Profile Data". United States Census Bureau. Retrieved 2016-03-13. ^ "Population, Housing Units, Area, and Density: 2010 - County". United States Census Bureau. Retrieved 2016-03-13. ^ "DP02 SELECTED SOCIAL CHARACTERISTICS IN THE UNITED STATES – 2006-2010 American Community Survey 5-Year Estimates". United States Census Bureau. Retrieved 2016-03-13. ^ "DP03 SELECTED ECONOMIC CHARACTERISTICS – 2006-2010 American Community Survey 5-Year Estimates". United States Census Bureau. Retrieved 2016-03-13. ^ "Page Not Found". wa.gov. ^ "1988 Presidential Election Statistics". uselectionatlas.org. ^ "Dave Leip's Atlas of U.S. Presidential Elections - Compare Maps". uselectionatlas.org.